WordPress 3.6 is now live, boasting a range of new features and bug fixes. You can check out the full highlights and changes here on their official website. But we’ll be running through the best bits of the new version in this blog post. 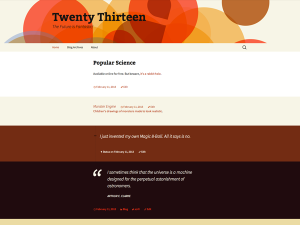 WordPress have replaced the default twenty twelve theme and brought in a new twenty thirteen theme which is about time. The new theme is clean and crisp working responsively and supporting the latest theme features that 3.6 has to offer such as post formats that we will talk about a little bit later on. The two most noticeable admin changes are when using revisions and the menus area in appearance. There are a range of changes in the admin section to help improve the user experience and make things a little easier. One that really stands out to me is the rework of the revisions section. It is now a much cleaner looking visual area and it clearly defines what area’s have changed and what those changes are using red and green highlights. There is a nifty little slider to select which revision it is your are comparing it to and then the option to compare two different revisions is clearly visible. The menus area has also had a revamp moving the theme locations block into its own tab with the new name Manage locations. The most noticeable difference however is that all the block sections to the left used to add menu items have been integrated into one block making it more visible and easier to navigate between. I do however dislike the fact that swapping between menus that have been created is less visible now being a drop down instead of the tabs that were previously used. Here’s a little on post formats as they are so key to the twenty thirteen theme. Post formats have been around since v3.1 and mean you can assign a format to an individual post which then changes how that post is displayed in your theme. 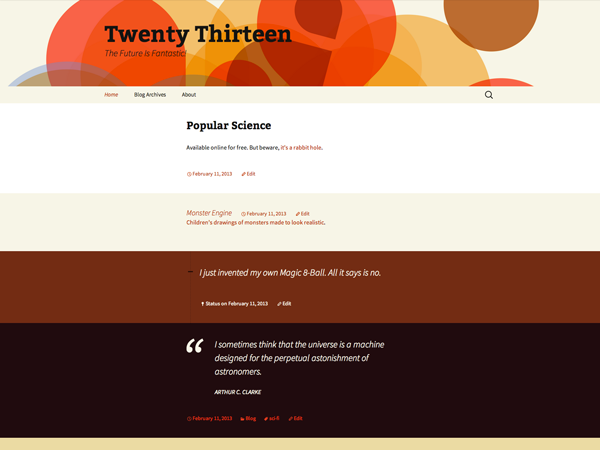 In the screenshot above showing the Twenty Thirteen theme you can see that there are coloured section blocks. These are each different post formats and therefor display different in your theme. This can be a great way to sort content as certain types of blog posts need to be displayed differently, for instance a quote wont need the user to link through to read it as it could easily just be displayed on the landing page of your blog.